Adhesive capsulitis is just one of the many problems that can affect the shoulder. It is more commonly known as a “frozen shoulder”. Most commonly adhesive capsulitis affects women aged between 40 and 60. The main symptoms are pain located in the shoulder joint. Pain can refer down the outside of the arm. 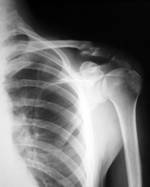 Pain is often worse at night and is associated with marked loss of motion, meaning the shoulder feels frozen. Most commonly people find they are restricted in moving their arm above shoulder height. Most severely affected is often internal rotation, which is the movement used to reach behind your back. Unfortunately the cause is unknown. The process may start as a chronic tendonitis where inflammation spreads to involve the whole capsule which results in capsular fibrosis. The fibrosis will start to cause adhesions between the joint surfaces which will limit range of motion. It is also suggested that this process could be a result of poor posture through the thoracic spine. Complete recovery can take up to 18 months but generally recovery is complete. It is important to maintain as much movement in the shoulder as you can. So, rest is not the answer. It is best to consult your osteopath if you are suffering from shoulder pain as treatment can help to maintain motion along with exercises that can be prescribed. Treatment of other shoulder complaints is also important as early diagnosis of tendonitis may prevent onset of adhesive capsulitis. Once the diagnosis has been made concurrent treatment may also be advised.